I've studied wild elephants for almost ten years now, and I've been asked many times about how we study these kinds of abilities, especially how elephants reportedly grieve. It's a hard kind of question to answer through science: even for our same species where we share the benefit of language, it's difficult to say you feel exactly the same as I do when I express the combination of sadness, denial and loss that make up my (personal) sense of grief. Some scientists are exploring elephant intelligence using captive elephant subjects. To do this, they are scaling up (on a grand scale) the kinds of tests and puzzles developed to explore the cognitive abilities of non-human primates. These include huge mirrors to explore self-recognition and tasks where individuals have to cooperate to solve a food task. So far, Asian elephants (the species most extensively tested) are doing pretty well in convincing researchers that they're smart. But what does that have to do with elephant grief? Well, it's obviously hard to study these kinds of phenomena systematically. But despite that difficulty, it's important wherever possible to use evidence that comes from wild animals, because studies in captivity inevitably involve individuals in abnormal (i.e. man-made) settings and who often have traumatic histories. Anecdotes (especially from experienced observers) from the wild can be used to build up a case file that deepens our understanding, and gives us an idea of how widespread and common elephant responses are. There are some things that are quantifiable when we observe elephants interacting with elephant carcasses. We can count the number of times they approach and touch the carcass, and where those touches happen. We can record whether they use a foot or a trunk. We can note if elephants vocalise, and how they interact with other elephants present. I recently witnessed this kind of behavior for the first time. 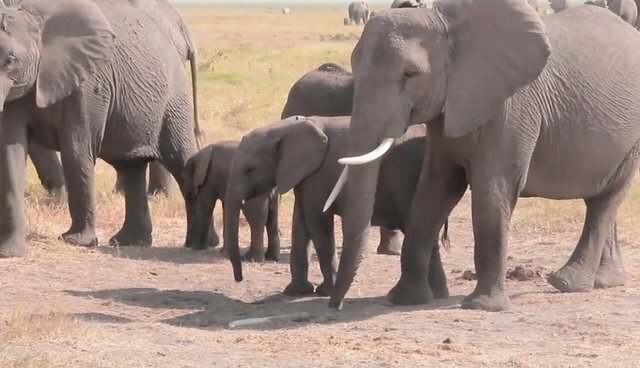 And I'll have to be honest: while those quantitive data are important, those frequencies, numbers and notes miss something fundamental about what it's like to watch elephants mourn. As a scientist, I wanted to collect data. As a communicator about what makes elephants special, I wanted to film the behavior so I could share it with others. As someone who knows and cares about the individuals in the film, I just wanted to witness it and be present. The GBs had a second death in the family: Georgia's daughter Graca died of unknown (natural) causes. I had been frustrated in being able to spend time with them for several weeks until I found a new way to cross the river separating the island they were using from the rest of the swamp. When I reached their spot, I discovered why they had been staying so close to this area: Graca's death site, by this time only containing her tusks and skull, was well trampled as the elephants had kept their vigil there. What was so profound about this discovery is that despite the age of the carcass, and the fact the elephants already knew it was there and had been spending time there for weeks, as they approached they quietly handled the bones with such tenderness and care. There was a lot of mutual comforting too - touches, body rubs and tail flicks. I have no doubt that the elephants were remembering. And I personally will never forget those moments, nor Graca herself either. Her memory is embedded in me by the quiet, graceful tenderness her family showed to her bones. - VF Learn more about IFAW efforts to protect elephants on our campaign page. P.S. On a happier note, Graca's 2012 calf is sticking close by her grandmother and cousins and seems to be coping. She is old enough now to survive without suckling from her mother, and in the comfort of her family we have every hope she will grow up to be a successful female.